The Americas Gallery gets a facelift — and the Museum gets an Interim Curator! Lekha Hileman Waitoller, who wrote the post below about our newly revamped Americas Gallery, has been the Curatorial Assistant here at the ASU Art Museum since 2008. Today we’re happy to announce that Lekha has agreed to serve as Interim Curator at the Museum until the end of 2011. Lekha received her Masters in Art History and Theory from ASU this spring, with a thesis titled “Destabilizing the Archive: Steven Yazzie, Lorna Simpson and the Counter-Archive.” She earned a Bachelor’s degree in Journalism (with an emphasis on Photography) and one in Spanish from the University of Missouri. Do come see the Americas Gallery, and, if you get here before August 27, you can also see Self-Referential: Art Looking at Art, an exhibition of works from the permanent collection that Lekha curated. One of the great things about living in the desert in summer is that things slow down. Most of us find ourselves pulled in fewer directions and better able to hunker down and chip away at our long to-do lists. For some time now the curatorial staff at the ASU Art Museum has been talking about how to make changes to the Americas Gallery—the gallery dedicated to works from the collection, including historic gems like our Georgia O’Keefe, David Alfaro Siquieros and Edward Hopper, (include hyperlinks that I have provided) that would otherwise be less available to our visitors, since our focus is on contemporary art. Years ago, much thought went into how to show these favorites. The resulting installation was an active salon-style installation of portraits called FACES, a chronology of WORK in the Americas and a selection of paintings that describe PLACE/SPACE. This summer we gave the gallery a facelift—a major one. Keeping with the original themes, we re-thought the Faces comparison through figurative sculpture—historic and contemporary—highlighting the ways artists have selected particular media and styles to convey meaning. 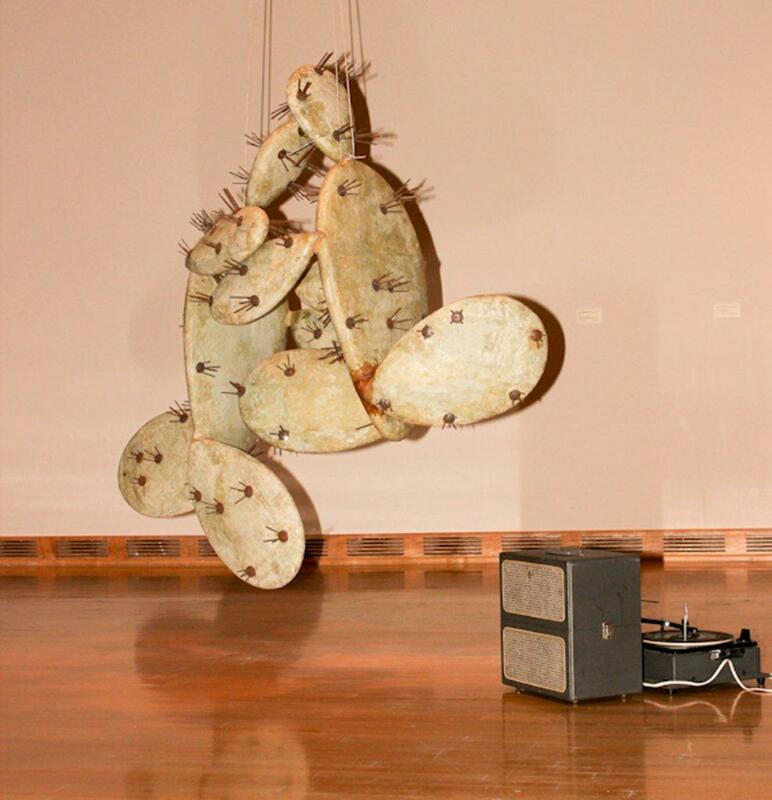 The installation is purposefully spare, inviting the viewer to make comparisons between the dissimilar works. 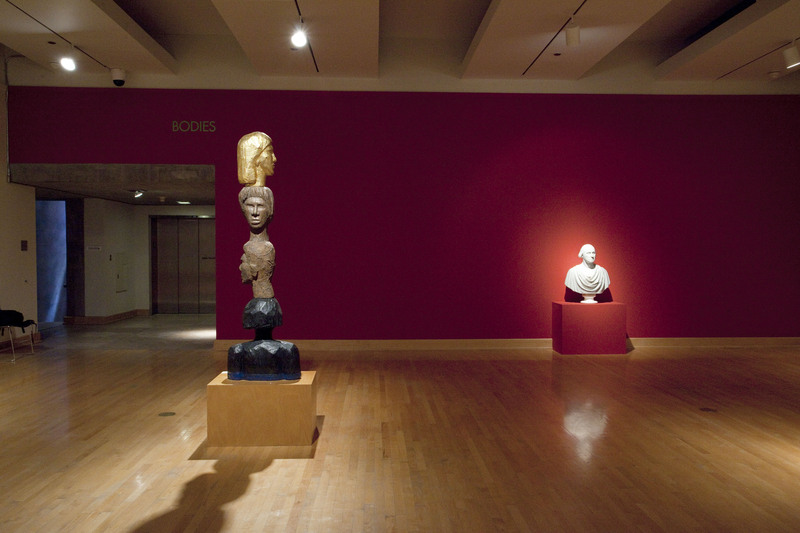 Alison Saar’s Hi Yella (1991), left, stands in contrast to Hiram Powers’ George Washington (1849). Photo by Daniel Swadener. Another major change is in the PLACE/SPACE installation, which loosely traces artistic styles describing both public and domestic spaces from the early 19th century through today. The earliest paintings look at landscape as a defining component of the United States’ national identity, while the most contemporary selections transition from Surrealist depictions to landscape demonstrating the collision of the personal and political. Dennis Oppenheim’s The Last Dance, 1994. Photo by Stu Mitnick. We hope that you will enjoy what we’ve done with the Americas Gallery and that the powerful works on view will provoke questions and dialogue. Please let us know what you think!